A couple of weekends ago, Sebastian and I left our town house and went for a little wander. We found a few little winding tracks that made us feel that we were no longer in the centre of town. I love that feeling... until we hear a siren! The weather is a little frustrating at the moment. One minute it seems to be blue skies and the sunshine is a little warm and the next day is so very windy and cold with drizzles of rain. We all just want Spring now please. 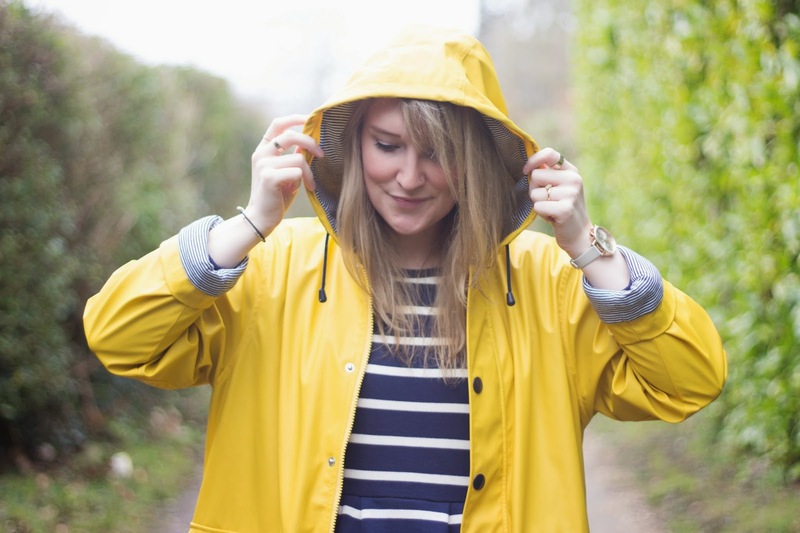 I cannot wait for the Spring showers so I can wear my wonderful yellow raincoat every single day! 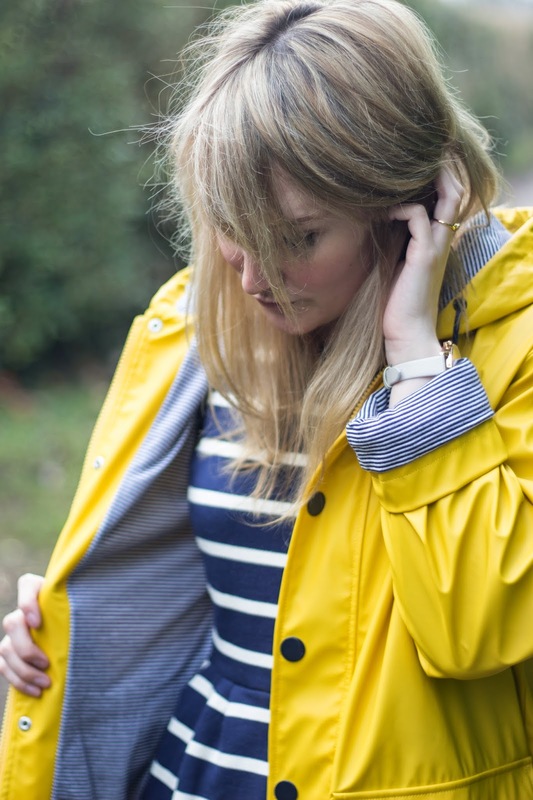 I have had this beautiful jacket from Petit Bateau since way before Christmas (thanks Alice!) and it has just been TOO cold for me to wear it- the cold raindrops require my warm woolen coat and wrap around scarf at the minute. The weekend that Sebastian and I went for a walk was such a lovely warmer day with threats of a shower so we had the perfect excuse to go out and pretend to be Coraline or a Fisherman, amongst the shrubbery. ...or at least I did the pretending! 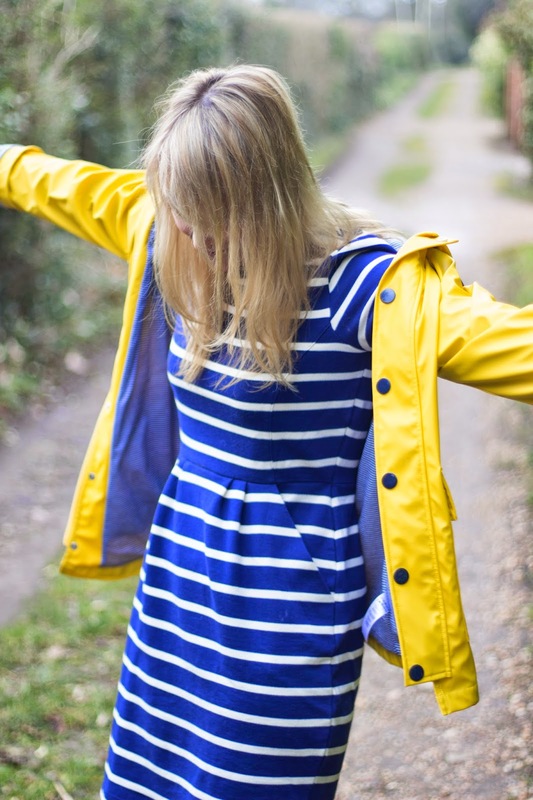 Along with my raincoat, I wore my beautiful new Breton striped dress. 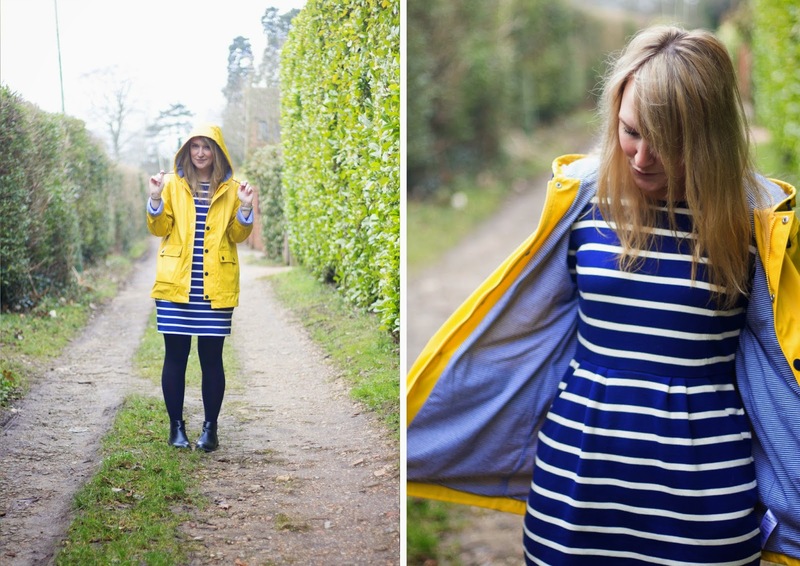 This dress from Joules is the perfect companion for my yellow raincoat. The tiny striped lining of the coat is so cute, clashing wonderfully with the bigger stripes of the dress. I have to admit that this gorgeous dress makes me feel like a lady. It is a casual fabric made in such a feminine cut and wearing it makes me feel so good! I can comfortably wear it to work with my hair pinned back, matte tights and brogues (and get a billion compliments) and I can wear it outside of work teamed with fine woolen tights and boots. Whichever way, the shape makes me feel so very good. Thank you Joules! You did good, you did real good! Until Spring arrives, I will be admiring this darling yellow raincoat that I had been coveting for so gosh darn long, patiently waiting for me on the coat hook and I will fill my house with Spring tulips and yellow daffodils. Also, in the mean time, The giveaway for those beautiful Joules floral mugs ends next Friday so you still have a whole week to enter! Good luck! I love that Joules dress. I nearly bought a raincoat from there yesterday but it was navy. They have some lovely pieces in but my store was tiny so didn't see this dress. It looks beautiful on you. That is literally my dream dress, I've been hunting for one like that for ages now! 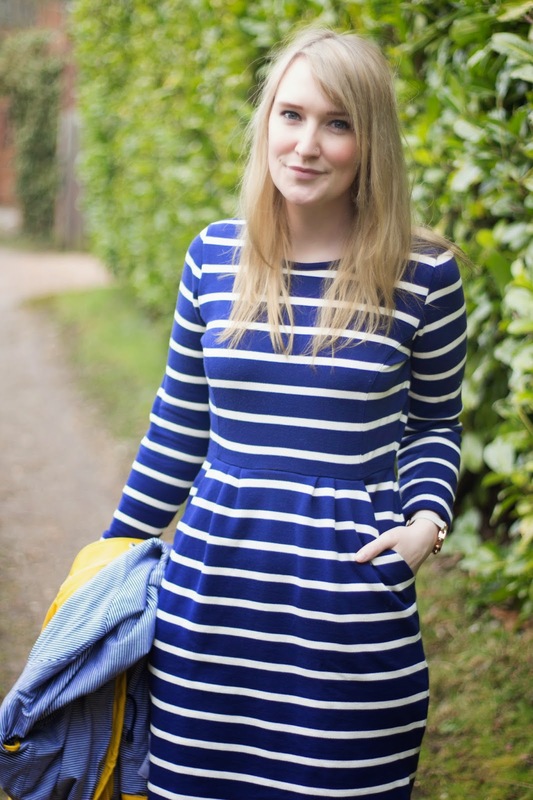 Most the stripe dresses I see are too tight, this one looks like such a good fit! I'll have to investigate! That dress is everything!! Buying now... sorry wallet!! 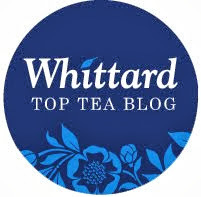 I just wrote that, and have been on the website and can't find it - is it new? I love your dress - glad you got some time away too. 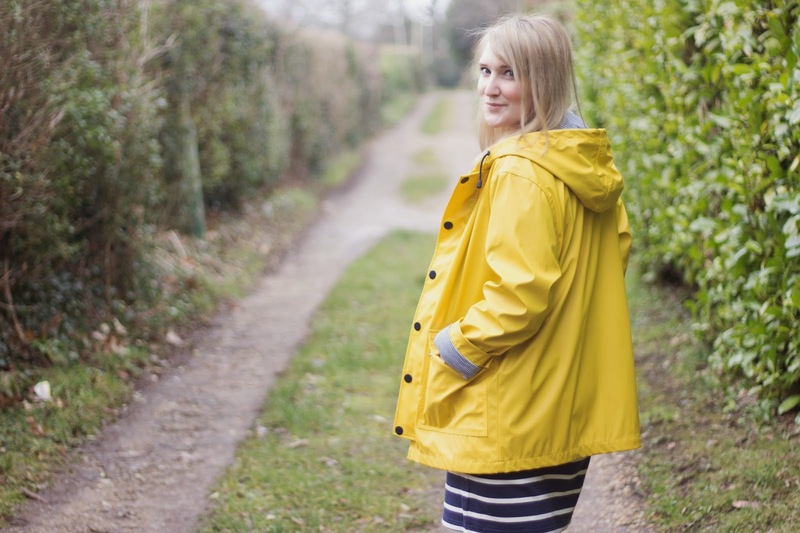 I've been longing for a yellow rain coat for quite some time, I must have one!